As a child I remember asking my parents why a road crew would bother going to all the trouble to blast through rock just to make the road more level. That looked like an awful lot of work. Why not save the trouble and go up over the hill? I can’t remember exactly what they said, but something about the ultimate benefits of a level road outweighing the work it takes to create it. It makes sense. The road would be safer, especially in the winter, without all the steep ups and downs. The evenness must be easier on vehicles. And I’m sure there are large fuel-cost savings for transportation companies because of less severe inclines. 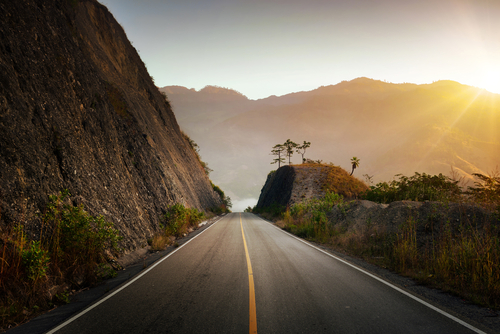 Our verse tells us that we have a choice of travelling down one of two types of roads in life: A level highway, like that smooth asphalt spread through carved rock and filled gullies. Or an overgrown path obstructed by thorns and briers. Notwithstanding some difficult paths God may call us to walk for His sovereign purposes (which is another chat altogether), we get to choose whether we travel on smooth highways or prickly pathways. Are we people living uprightly or correctly? That is, are we stewarding our calling, relationships, bodies and possessions the way God has instructed us to? Or painful slogging through dense and thorny terrain. No one actually wants the hard path, but it is often chosen because it looks like the easier one initially. Let’s be honest. Doing is always more work than not doing. Playing is more fun than working. Procrastination is easier than planning and execution. Big Macs are easier than homemade salads. But God’s wisdom warns us: With each surrender to laziness, we plant thorn bushes in our path ahead. Sin remains in my heart that continues to thwart my character and poison my relationships. I have not collected the wisdom necessary to sensibly evaluate choices and therefore, seem to repeatedly choose courses that complicate my life. My failure to study, read, memorize, pray and draw near to the God robs me of the power to live rightly. Period. I will not inconvenience myself for another’s benefit so my relationships are stunted by the absence of self-sacrificing love. I will not have the difficult conversations required to alleviate conflict and restore intimacy which will result in increased distance from all the rubble that collects between us. I will exert little effort to temper my words which only compounds my work load. The work I now have to do to repair the damage my speech has caused is much harder than exercising the self-control that could have prevented it. Instead of the manageable maintenance normally required, the work necessary to reverse declining health is severe and becomes a matter of life & death. Any irreparable damage to my body caused by neglect & easy choices robs me of many God-given pleasures and requires increasing time and finances to manage. The clutter that collects robs my family of tranquility and ensures that I rarely, if ever, practice biblical hospitality. Car or house maintenance that would have been moderate in cost becomes a matter of urgent repair requiring more work and greater expense. Interesting isn’t it, when we look at it that way? It is actually a great irony that in an attempt to avoid work and find an easy road, we cut for ourselves a cumbersome path and create much harder work than that which we tried to avoid in the first place. As much as it looks that way at first, laziness is never the easy road. God’s wisdom is perfect and you can take him at his word. Initially life-stewarding diligence seems like hard work. But ultimately, it is the easy road. Excellent, helpful post! Thanks Janet! Thanks for the encouragement Angie. If I had been speaking about general choices (not just the one diligence/lazy choice) I think I would have added that idea. I have love, love, loved the “Y” chart and the truth it oozes with! Thanks for including the link. Blessings on your ministry of truth. I hope the example about piling doesn’t have anything to do with my red toolbox in the Garage! Didn’t even cross my mind, it’s so tidy these days! Thanks for posting practical biblical information! I enjoy reading your posts- you’re a talented writer!